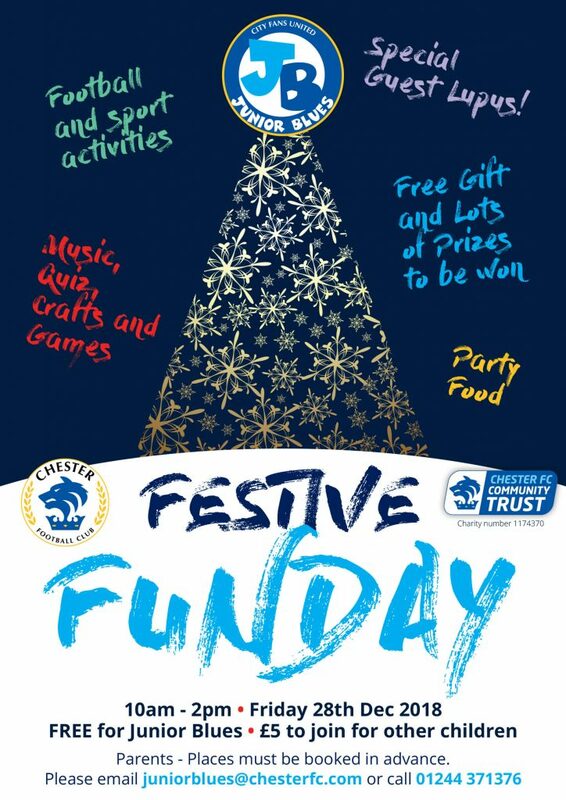 This year’s Junior Blues Festive Funday will take place on Friday 28th December at the Swansway Chester Stadium. The party runs from 10am to 2pm and is free of charge for Junior Blues members with children who are not currently members able to sign up for £5. There is lots of festive fun planned for children of all ages including football and sport activities, music, quizzes, crafts and games. Junior Blues still to collect this season’s membership packs will be able to do at the party. To book places, email juniorblues@chesterfc.com or contact the ticket office on 01244 371376. 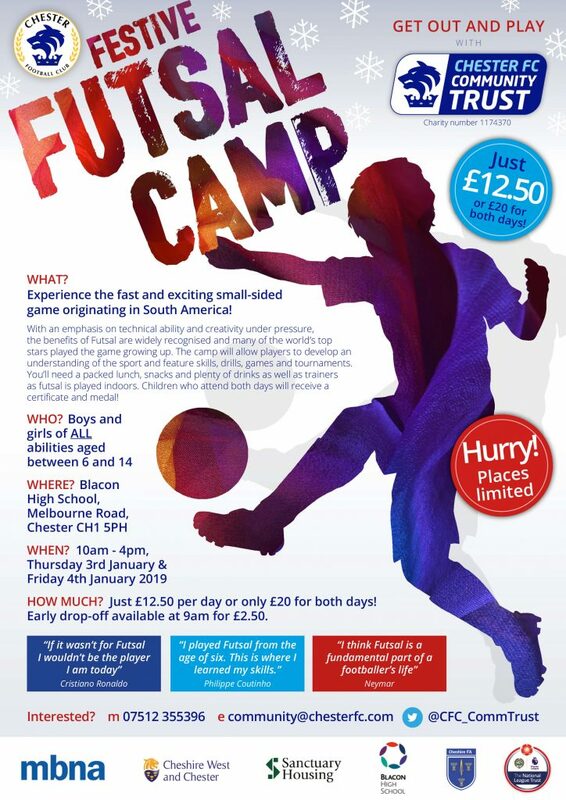 Chester FC Community Trust is hosting a two-day Festive Futsal Camp at Blacon High School in January. Last year’s event sold-out in record time and demand is again expected to be high for the indoor camp, which takes place on Thursday January 3rd and Friday January 4th. The Chester FC Festive Futsal Camp allow players to develop an understanding of the sport and feature skills, drills, games and tournaments. The camp is for children aged 6-14 and runs from 10am until 4pm each day with an optional 9am early drop-off available for parents. Youngsters will need a packed lunch, lots of drinks and trainers. Every child who attends will receive a certificate with medals for those who attend on both days. The camp costs just £12.50 per day or only £20 for both days. The optional 9am early drop-off available is an additional £2.50 each day. Futsal is a fast and exciting indoor version played across the world and is becoming more popular in the UK with The FA launching a new national Futsal Super League earlier this year. Futsal helps develop close-control, quick thinking and different techniques to traditional football with superstars like Neymar, Cristiano Ronaldo and Coutinho crediting the game with shaping the players they are today. Places are limited and can now be booked via community@chesterfc.com, on 07512 355396 or online via Eventbrite for a small additional booking fee at community.chesterfc.com/book-online. Chester FC Community Trust is pleased to announced it is hosting a Primary Teachers’ Award CPD event in partnership with The FA. The course, which is free for teachers, teaching assistants, NQTs and PGCE students, will run from 9am to 4pm on Thursday 25th April at the Swansway Chester Stadium, home of Chester FC. The FA Primary Teachers’ Award designed for any practicing or aspiring primary school teachers and it has been hugely successful in developing teachers’ confidence to deliver high quality PE. The course presents ideas for lessons using games based around movement skills for 5–11 year olds and the basic principles of invasion games. The tutors show how differentiation and assessment for learning can be embedded in PE lessons and also give guidance to those teachers who might run a school team. 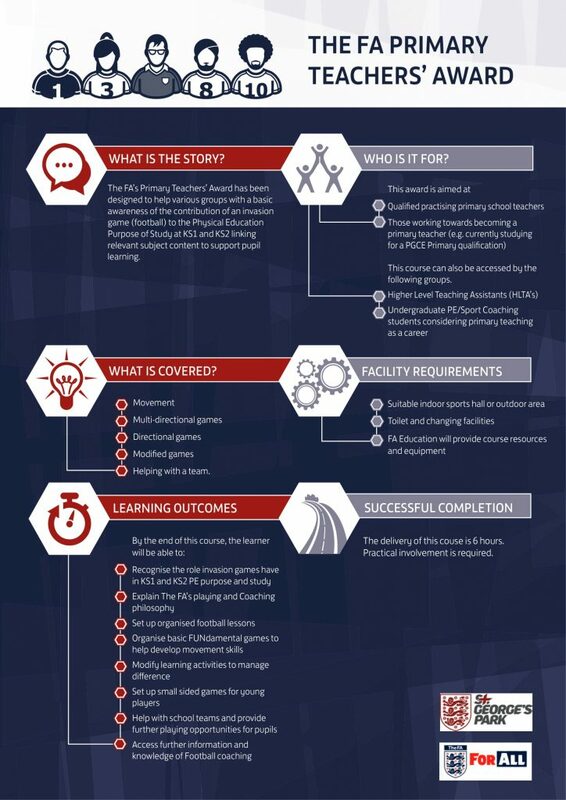 It is applicable for those who wish to build on their existing knowledge and those with little confidence of PE or football. Throughout the course, the tutors will also explain the importance of high quality PE in schools in order to develop confidence, self-esteem and belief amongst children and also the benefits of PE in raising academic achievement across other school subjects. Requirements: Please bring a packed lunch and come prepared to take part in practical activities. To book places for the course, register through Eventbrite here. For further information email community@chesterfc.com or contact Jim Green on 01244 371376.